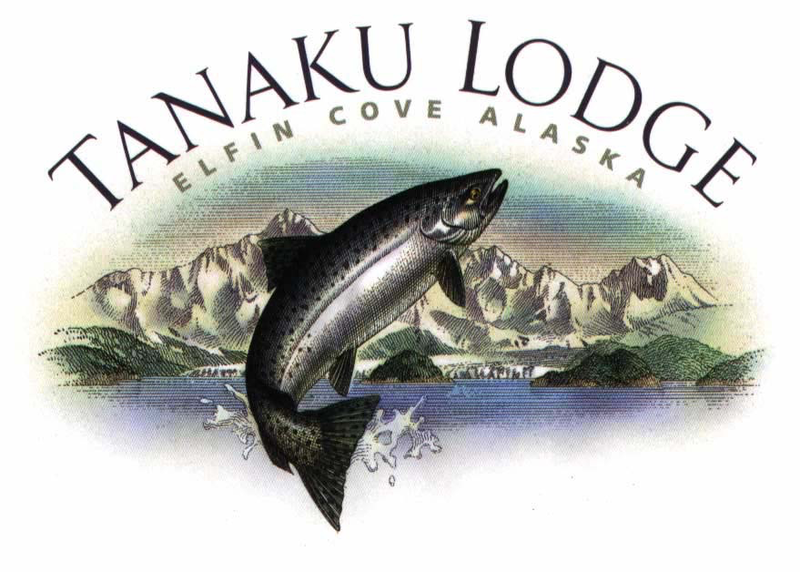 Welcome to Tanaku Lodge, Alaska's best sport fishing lodge! We are located on the northern-most tip of the famed inside passage in the boardwalk community of Elfin Cove Alaska. Our southeast Alaska location is well-known for its extraordinary fishing action and our Alaska lodge is renown for its superb guest services, four-star cuisine, excellent guiding staff and down-home hospitality! Our Alaska lodge is the perfect vacation destination for those seeking an escape from the disquiet and break-neck tempo of city life. It doesn't take long for our guests to be transformed by the mixture of our friendly lodge services and the embracing quiet and pristine wilderness found here. Our fresh air will intoxicate you, the abundant wildlife will thrill you, our epic glacial scenery will captivate you, and your fishing success will make you return with the migrating salmon each season! Elfin Cove, Alaska is a small fishing community located on Chichagof Island. There are approximately ten residents who live here during the winter months, but this sleepy hollow comes to life during spring and summer due to the tremendous runs of ocean-brite salmon. Yes, our fertile waters provide you with a virtual bonanza of fishing action and plenty of angling options! Whether you are chasing a trophy king, looking to vertical jig a silver, or catch a barn door halibut, Elfin Cove will not disappoint. Whether your orientation is fly-fishing with an emphasis on catch and release, or hot and heavy saltwater angling with a desire to take home boxes of fresh/frozen fillets and steaks - Tanaku Lodge should be on your short-list of where to sport fish anywhere in the world! There are a number of streams and rivers nearby where you can match your fly, bait or lure casting expertise against lively dolly-varden, trout, and pink and coho salmon. The water is so crystal clear you can see the fish strike your fly or lure! Man Oh man, it just doesn't get better than this! Guests often ask when is the best time to come to our lodge. 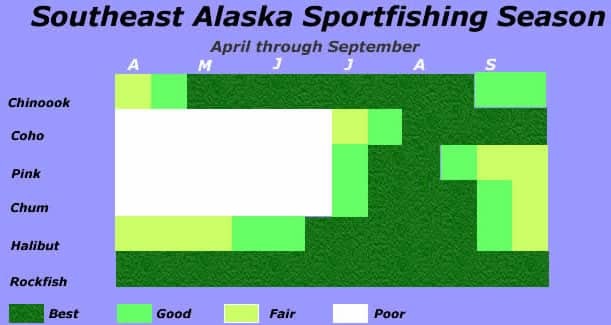 The season is excellent all year, but if you are targeting a specific catch the following chart helps you learn a little about the fish runs. To get a glimpse at just how awesome our Alaska sport fishing action check out our fishing reports page, which is updated daily with the latest fishing adventures from the Lodge. Or head over Tanaku Tube, where you will see our guests' fishing videos, or visit the photo gallery. Our dedicated goal and 100% focus is to assure each guest vacationing with us has a wonderful Alaska lodge and sportfishing experience. We hope to have the pleasure of sharing our world-class Alaska sport fishing lodge! "We have been bringing a group to Tanaku for the past three years. Once you have experienced the "Tanaku Charm" it is hard not to come back each year. We have tried different periods from early June to late August and each trip filled our expectations of fishing, food and fun. The staff at Tanaku has made each of our trips a "once in a lifetime" experience!"